Advertisements flooding your browsers may be linked to the Sharp-savings extension created by Smart Apps. Even though this extension is presented as a beneficial tool which should help you keep your money in your pocket while shopping online, it has been discovered that you cannot download it from the official page sharp-savings.com. This may be surprising to you; however, to malware researchers this is no surprise at all. The developer of the suspicious extension is also responsible for Atomic Savings, Dealfox, Deal Dropper, and other advertisement supported programs, none of which represent working official download links and all of which we recommend having deleted. Unfortunately, this is not the only suspicious thing about the plugin, and so we recommend that you remove Sharp-savings. Sharp-savings is deleted as an advertisement supported program because it allows the flooding of various online ads. What is worse – these ads are managed by and represent the services of third parties. Of course, one might argue that no online application would survive without sponsorship; however, you need to be smart about the programs you choose to trust and be careful about how they work. Unfortunately, allowing the activity of third parties could be quite dangerous. The truth is that vulnerable advertisement supported programs are often used by unreliable parties. Even schemers could trick the developers of Sharp-savings to display completely unreliable and bogus ads. In most cases, Sharp-savings ads are represented via pop-up boxes. We recommend that you ignore these ads and do not click on them. It is highly likely that the displayed pop-ups, banner offers and in-line ads will simply hide links to third-party websites, and not all of them will be reliable. Do you want to risk your virtual security and end up on corrupted or unreliable websites just because of some saving deals? You certainly should not take your virtual security for granted. Even though Sharp-savings removal is not as complicated as one might think, you may have trouble with the removal of additionally running adware and potentially undesirable programs. Since the plugin is not available from its official site, there are no doubts that it can enter the operating system bundled with other software. Due to this, after you delete Sharp-savings using the removal guides below, we strongly recommend installing authentic Windows security software which will detect and delete all existing threats. Keep the downloaded software up-to-date if you wish to have the virtual security guarded at all times. 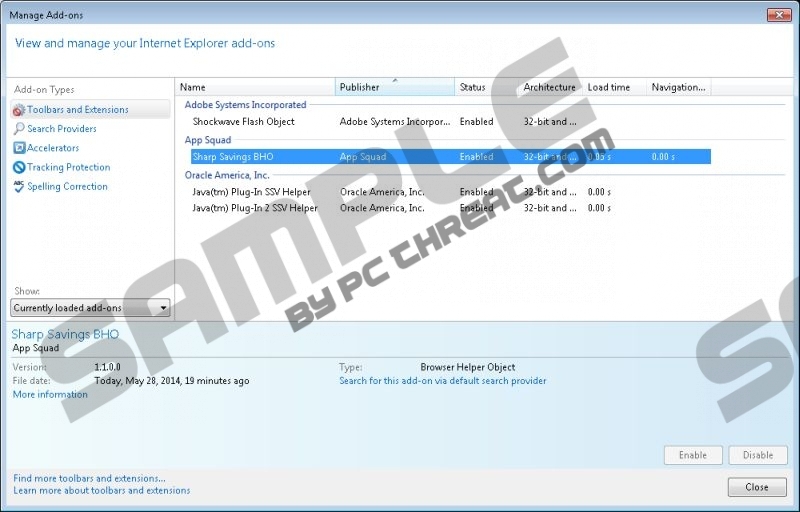 Double-click Add or Remove Programs and you will find the installed software. Now open the Control Panel move on to Uninstall a program. Quick & tested solution for Sharp-savings removal.